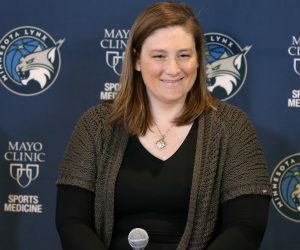 The Minnesota Lynx improved to a WNBA-leading 17-2 on the season with a 76-75 win over the New York Liberty on Tuesday night at Xcel Energy Center in St. Paul. 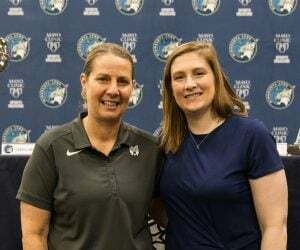 Lindsay Whalen stepped up big when Minnesota needed her most in Tuesday’s win. Along with her 12 points, eight of which came in the second half, Whalen hit the go-ahead shot with 47.7 seconds remaining to put the Lynx up for good. Whalen hit a double-clutch jumper along the baseline while being guarded tightly by New York’s Kiah Stokes. The Liberty came within one late in the game, but missed a chance to win the game when Sugar Rodgers missed a three as time expired. Maya Moore continued to build off of her strong first half of the regular season and her MVP-performance in the 2017 WNBA All-Star Game on Tuesday night in St. Paul. 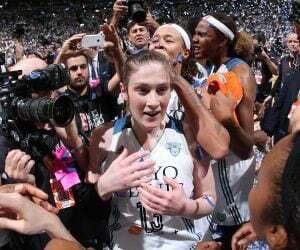 She led the Lynx with 27 points and five rebounds, while shooting 11-for-20 from the field an 3-of-5 from three. Along with Moore, Sylvia Fowles had 18 points, nine rebounds and four blocks, Plenette Pierson had seven points and five rebounds off the bench, Seimone Augustus had six points, three rebounds and three assists and Jia Perkins added four points. 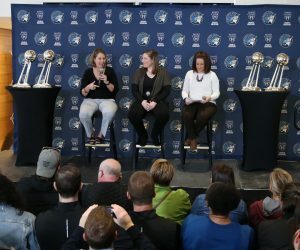 Coming into the game, many people were looking to see what Minnesota’s Sylvia Fowles and New York’s Tina Charles, the two WNBA Players of the Week for the past week, could do against each other in front of the Xcel Energy Center crowd. They lived up to the hype. Fowles finished the game with 18 points, nine rebounds and four blocks. She shot 6-of-9 from the field and went a perfect 6-for-6 from the free throw line. Charles tallied 24 points and 16 rebounds in the game, getting out to a nice first half with 20 points and 10 rebounds by halftime. She shot 10-of-20 from the field and went 1-for-3 from three. 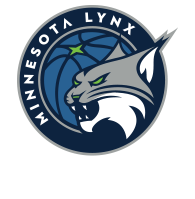 The Lynx return to action on Friday when they take on the Atlanta Dream at 6:30 p.m. in Atlanta. The game will be aired on Fox Sports North and 106.1 BOB FM.